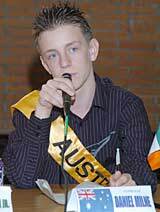 On October 1, 2005, youth from around the world converged on Los Angeles. They came from Russia, Canada, Australia, Italy, China, Sri Lanka, South Africa and elsewhere. They came for the 2nd Annual Youth for Human Rights International (YHRI) Youth Summit! 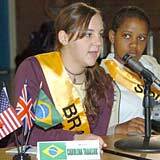 This three-day event enabled youth from around the world to formulate action plans on how to use human rights to create a more peaceful world. Article 18 of the Universal Declaration of Human Rights states that we all have the right to “freedom of thought”. 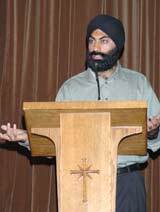 In recognition of this right, a multi-faith service was held on Sunday morning with Islam, Buddhism, Christianity, Scientology, Judaism and Sikhism represented. 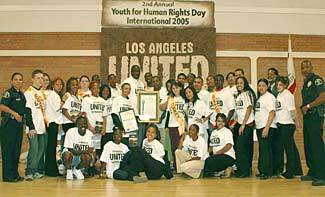 On October 1, 2004, the Mayor of Los Angeles officially proclaimed Youth for Human Rights Day International. This year, California State Assemblyman, Mervyn M. Dymally, also proclaimed this day, which was celebrated with a youth summit at David Starr Jordan High School. Delegates discussed human rights across the world with students of Jordan High and formulated projects to work on together. 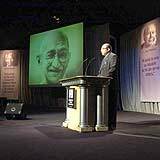 The events cumulated in a celebration of the life of Mahatma Gandhi and other great humanitarians of the 20st century, including Martin Luther King, Jr., L. Ron Hubbard and Nelson Mandela. Each was honored with a biographical reading accompanied by a slide projection depicting their lives. Delegates returned home with their horizons greatly expanded regarding what they can do to create positive change in their countries and the world.